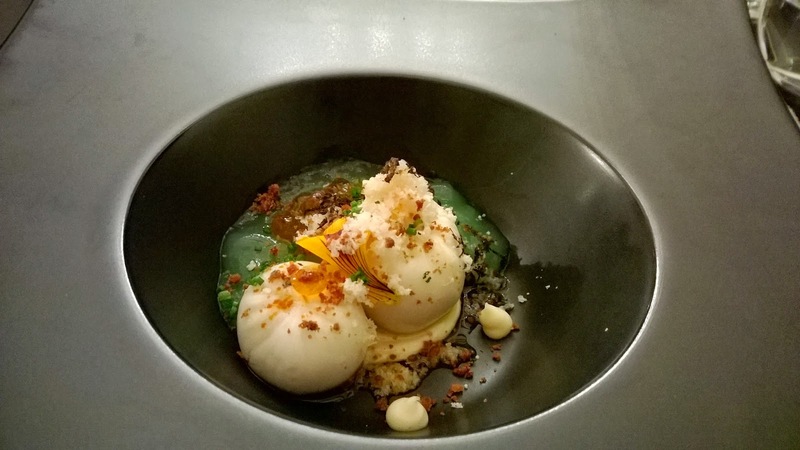 There are exciting things happening at Sofitel. They are aware of the power of marketing and competition, and have realised that to survive in a tough market with new top end properties opening all the time, they need to be open to trying different things. They have been prominent in recent months on Groupon, a website that offers discounts on dining, hotels and leisure. What this does is create brand awareness. I think it a smart ploy. In continuing their trend of being open to new things, I revisited them yesterday as they were planning on introducing two new afternoon tea sets. I think there is something exciting when one is able to make a difference to a restaurant's menu by offering constructive feedback. It was this in mind, that I headed back. 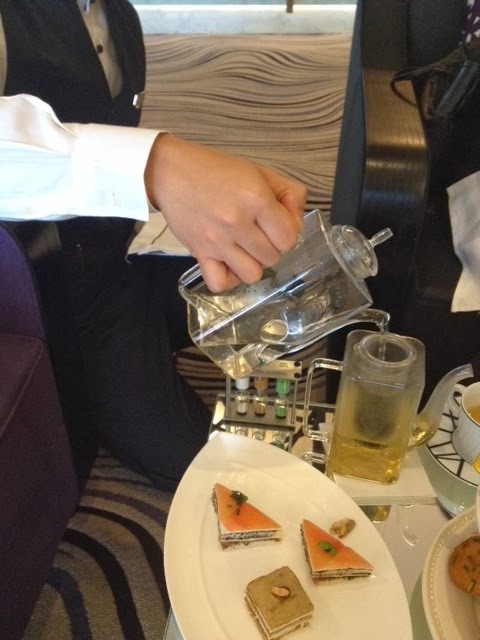 Briefly, they are revamping their Afternoon tea by serving it in a new dedicated area. I commented last time that I thought the tables were far too low, and more ideal for drinks a very light snacks. 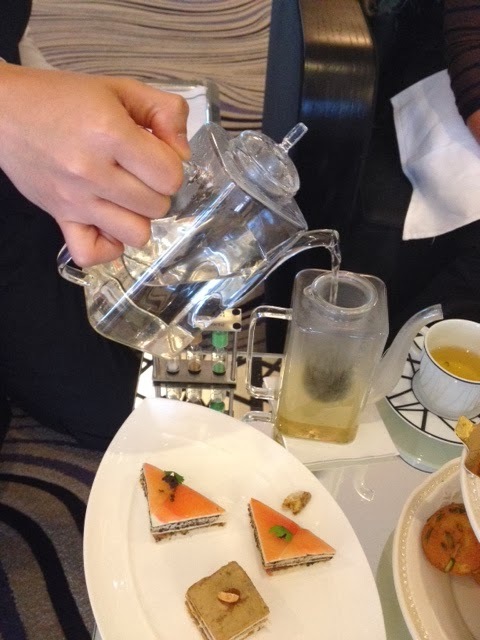 Afternoon tea or especially High tea is quite substantial in what it offers, so having comfortable seating is important. In one day, you may have 3 or 4 guests ordering afternoon tea, so all you really need is to have that amount of appropriate tables available. Almost perfect, but a work in progress. The new tea sets, the French and English, are intimidating. 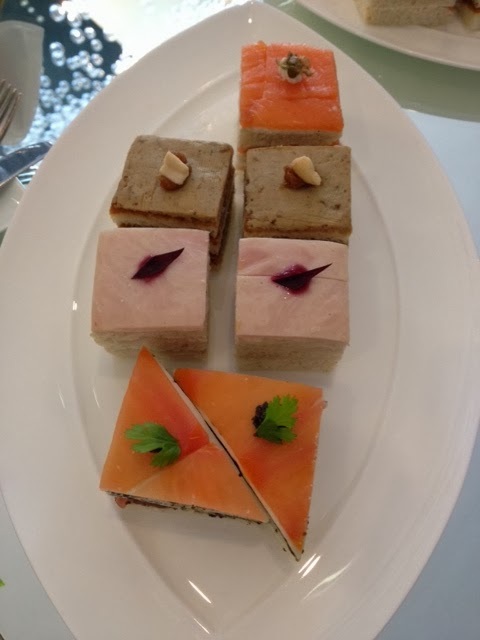 They include the excellent sandwich selections with those fantastic combinations (see http://mitsukiemma.blogspot.ae/2013/12/sofitel-abu-dhabi-afternoon-tea.html). The sandwiches were again fantastic, brimming with freshness and flavour. I still would like to see them go with the more traditional two slice sandwich. Afternoon tea is all about presentation. It is a world of pretty and dainty things. And besides, triangles beat squares anytime. Moreover, the tea set really is big, so smaller sandwiches will not leave people unsatisfied. Less is more. The scones were, as last time, tasty, light and soft, but not doughy and were accompanied well by the jams and clotted cream. The jams this time were a marmalade and apricot/peach selection. The issue with this is colour. You need a strawberry or raspberry option. Beautiful juxtaposition of colour. Next though, on to the new additions. The French-inspired set had came in three tiers with immaculately presented strawberries and macarons on the top tier. The macarons were perfect. Bite size. 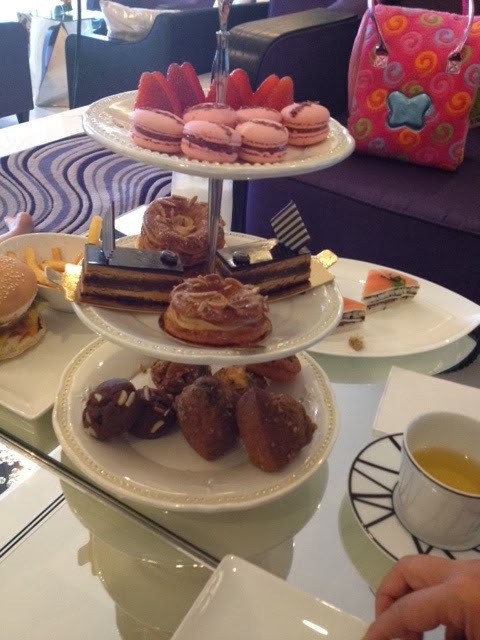 The second tier featured French classics like Opera cake and Paris Brest. A taste explosion. However, they should consider losing the selection of muffins on the third tier. They just overwhelm the tray. They could replace the muffins with the scones. 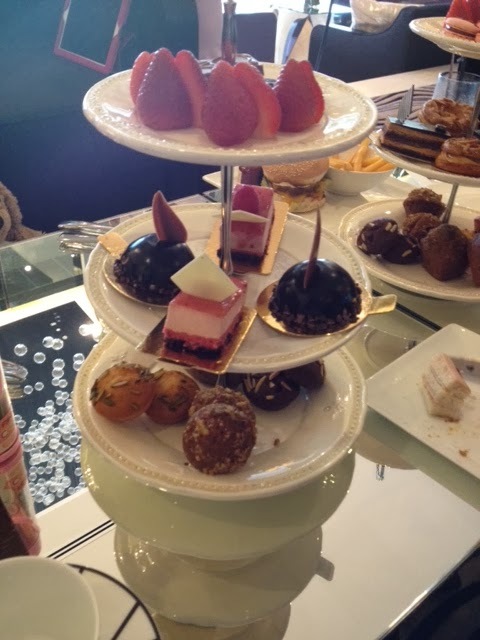 The English inspired Afternoon tea had a first tier with strawberries and wafer size chocolate delights. The second tier featured delectable chocolate and raspberry domes. Pure indulgence. The muffin selection again appeared on the third tier. See comment above. Special attention was paid to the actual tea on this occasion. No mistakes this time. Our waiter showed us the possibilities of great service. I have deliberately left something special until the end. My biggest concern last time was that the service, while efficient, was flat and uninspiring. On this occasion, we had the good fortune of being waited on by the best waiter I have encountered in Abu Dhabi. A good waiter has an excellent product knowledge and offers professional but soulful service. Justin, our waiter, did just that. Waiting staff in Abu Dhabi often try to do too much and as a guest you reach the point where you feel, "Okay, enough already." Or they are mechanical with all those extra unpaid hours taking their toll. Not Justin. He had a calm and personable demeanour founded on a deep seated humble confidence. He was able to recommend a tea that matched what we were eating. Later he served the tea, while explaining the importance water and of brewing tea the correct amount of time. This was someone who cared deeply about his guests enjoying their tea drinking experience. His face lit up when he could see a satisfied look after I sipped on my tea. Such passion! Underneath all of this, there was sincerity. Of course if you forsook the option of tea, there is also a lovely selection of coffees. Yes, I have seen people enjoy their afternoon tea with a cup of coffee. If you choose coffee, I recommend a strong black. So, American with an extra shot of espresso. No sugar. The sweet treats will balance the coffee beautifully. 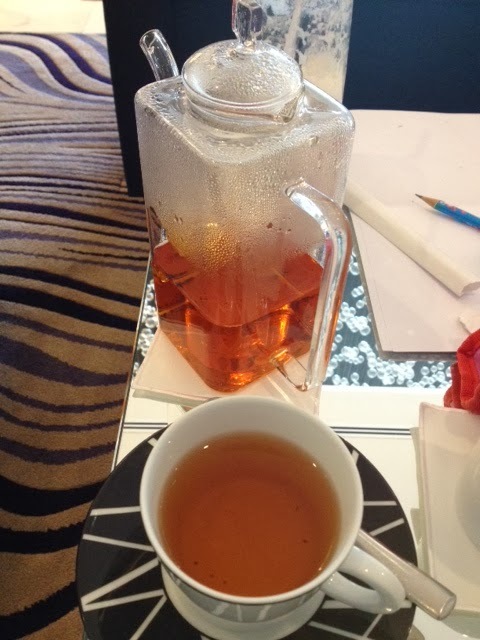 The Perfect cup - Damman's Paul and Virginie tea. This is what the food and beverage waiting industry is all about - people like Justin who work under the same demanding conditions as others but who rise above mediocrity and the mundane. People look for different things when they visit a restaurant. Some place a premium on the quality of food, the ambience, the rice, etc. Me, I can go back to a place where above average food is served by people who value and respect what they do, and do so with a sincere smile and passion for their calling. I think if Sofitel makes a few minor tweaks, they could be offering a very special Afternoon tea. 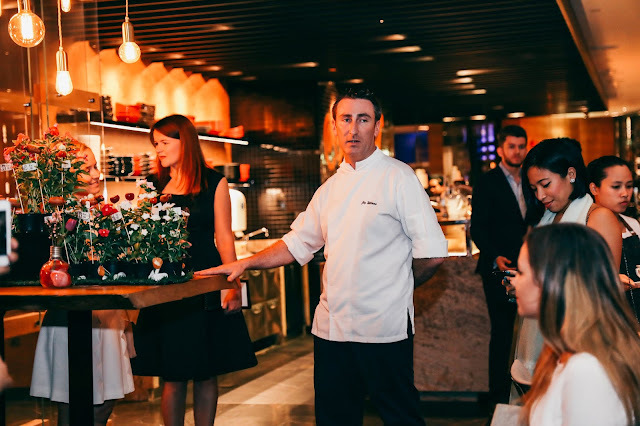 More importantly, if they can use Justin to inspire his colleagues to serve with the same care and verve that he does, they could be serious contenders for one of the best Afternoon experiences in the city.